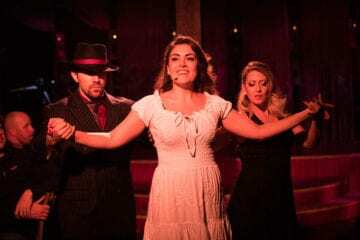 On Wednesday night, the Atlanta Opera presented the first of four performances of David T. Little’s one-act opera Soldier Songs at Georgia State University’s Rialto Center for the Arts, in downtown Atlanta’s Fairlie-Poplar Historic District. This new production Soldier Songs by the Atlanta Opera and Giving Light Memory+Motion+Relevance (GLMMR) is about an hour long, with performances at the Rialto Saturday night and Sunday afternoon. Soldier Songs is as much a multimedia event as it is an opera, almost more so, but the essence of the work lies squarely in its core story. The libretto was compiled by Little from interviews with American military veterans of five wars. Making his Atlanta Opera debut with Soldier Songs is baritone Matthew Worth as the Everyman soldier. In this performance, Worth offered up a splendidly taut performance in a role that leaves little time for anything outside of emotional extremes. His acting and his bracing baritone voice were both up to the task; the wide range of his vocal role required him in one scene to float up into the relative stratosphere of the tenor domain. Matthew Worth plays the Everyman soldier. 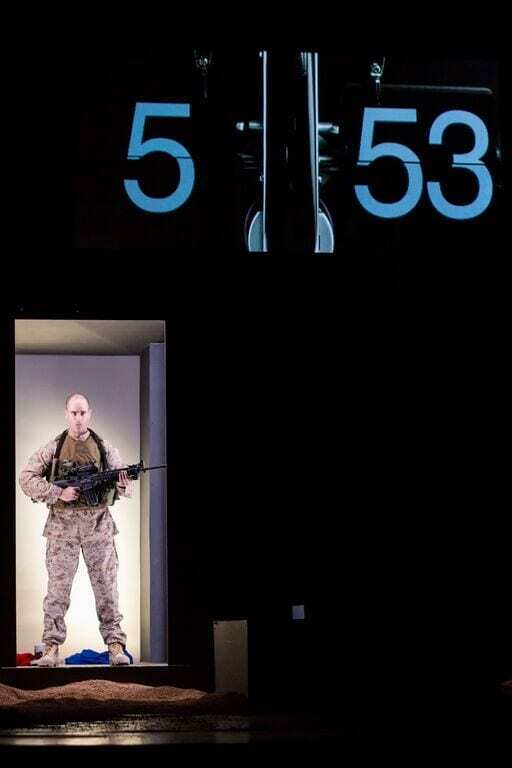 Worth has become noted for his performances of contemporary opera, including debuting the role of the Son in Kevin Puts’ political thriller opera, The Manchurian Candidate, with Minnesota Opera this past March. In late April 2016, Worth will also premiere the role of president John F. Kennedy in JFK, another opera by Little, with a libretto by Royce Vavrek, at the Fort Worth Opera. The cast also includes two supernumerary roles with significant stage presence played by local actors: a retired veteran played by Lee Buechele (misspelled Buchele in the program) and a boy played by child actor Joseph Masson. These roles are quickly surmised as older and younger extensions of the Soldier, likewise in an everyman manner. Buechele had a military career as a lieutenant colonel in the U.S. Army, before turning to acting in local theater — an ideal background for his part in this performance. Masson has been developing his own local track record as a child actor, and is slated to play Tobias Ragg in the upcoming Actor’s Express production of Sweeney Todd that opens January 23. This triad of aspects of the soldier are not superfluous; they are all essential to the work’s dramatic temporal arc, which serves as a window into the mind of a soldier from childhood and youth to retired senior. The other major insights into that mind come through the work’s extensive multimedia. GLMMR production designers Victoria Tzykun and David Adam Moore, and lighting designer Maxwell Bowman, all made their Atlanta Opera debuts in the production of Schubert’s Winter Journey earlier this year. As in Winter Journey, the trio gave Soldier Songs a neutral abstract set with multiple platforms and an irregular backdrop upon which multimedia elements were projected. The lighting was unobtrusive, but became bigger and more elaborate with the addition of special effects — such as air-raid sirens, flashing red emergency lights and smoke for a battle scene. At times multiple quotes from soldiers were projected on the set while audio of them was heard, individual letters dropping out of position, then spinning rapidly through the alphabet which followed them as the quotes dissolved. 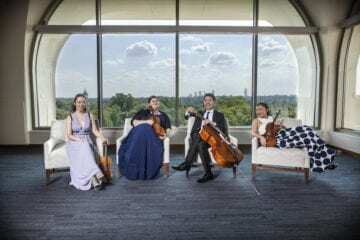 Unlike Winter Journey, which had only piano accompaniment, Soldier Songs featured a small pit orchestra of seven musicians expertly led by Christopher Rountree, who was making his Atlanta Opera debut as conductor. 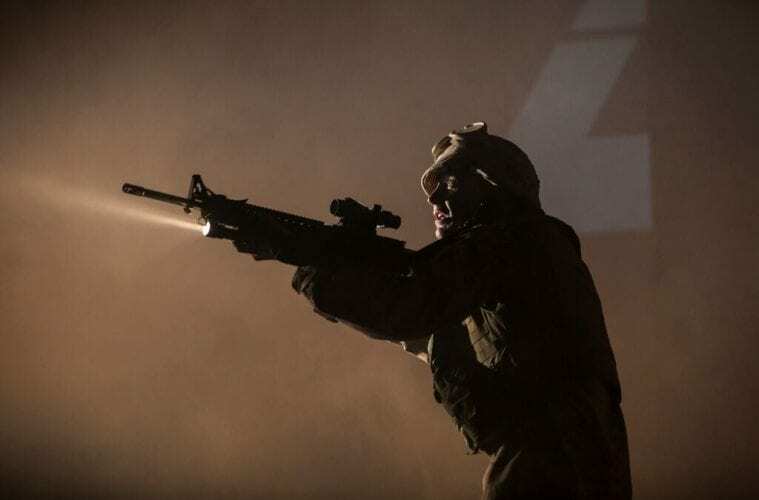 Despite all the trappings of electronic spectacle, the brunt of the opera’s intense emotion still resided with the Everyman soldier — with a lot of physical action scenes for Worth. But there are also times where Worth doesn’t sing for what seem palpably long and anxious time spans. When he does finally sing, his voice comes with an inner and inarticulate rage in a few short bursts of phrases. This southeastern premiere of Soldier Songs — again, in a brand new production — proved a powerful statement, especially and not coincidentally performed as it was on Veterans Day.